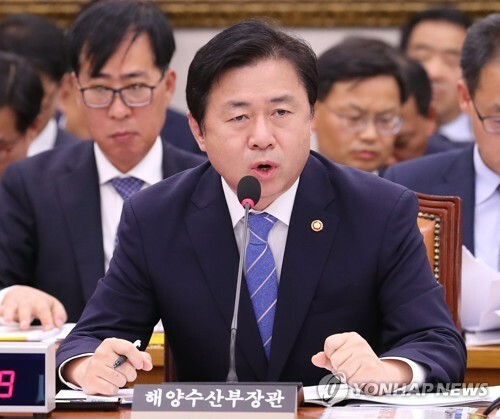 SEOUL, Oct. 18 (Yonhap) — South Korea and the European Union have agreed to work together to tackle illegal, unreported and unregulated (IUU) fishing to promote sustainable fisheries, Seoul’s maritime ministry said Thursday. Kim Young-choon, South Korean minister of oceans and fisheries, signed a joint declaration on IUU with Karmenu Vella, European Commissioner of Environment, Maritime Affairs and Fisheries, in their meeting in Brussels, the ministry said. South Korea became the fourth nation to sign the joint declaration to combat IUU, following the United States, Japan and Canada. The two sides also agreed to expand technical and policy cooperation for a sustainable ocean industry and to share know-how with developing nations in Southeast Asia and Africa, it noted. South Korea was removed from the IUU list in 2015 after it strengthened measures on fishing vessels operating abroad and forced Korean vessels to operate in line with international guidelines.